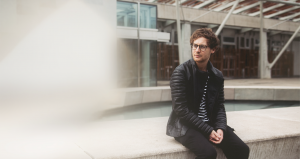 Edinburgh native Theo Kottis didn’t take his time entering the dance music industry. He began by throwing “We Own” parties in his home town with his friends at the age of 18, hosting big acts such as Pete Tong and Disclosure. Hours before the We Own doors opened, Kottis took the opportunity to hop onto the decks, practicing his DJ skills for the first time. Flash forward to today – In his young career Theo Kottis is an esteemed artist as both a DJ and producer. 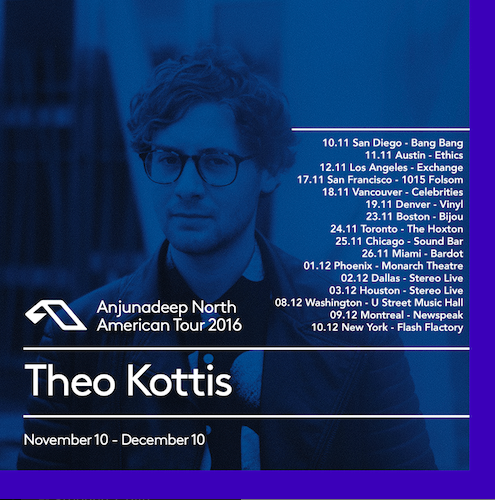 We recently had the chance to talk to the man himself before his show at our own Bang Bang along side Luttrell and YOTTO, marking the first stop of Anjunadeep’s 2016 North American Tour. At the age of 18 you were already promoting / throwing raves in your hometown of Edinburgh. Describe your early days within the Edinburgh dance scene. My music taste back then was different and hadn’t matured yet. It was very cool to be the first to bring acts such as Dusky & Disclosure to Scotland, it was always fun meeting DJs, seeing how they worked and I slowly became inspired to start producing myself. The biggest party I threw was with Pete Tong & I managed to hire out an entire shopping mall, it was amazing seeing 2000 people using the escalators to move around the venue whilst partying! When did you first recognize the artist within you? I’ve loved music from a young age. I was in a Philharmonic orchestra when I was 8, playing drums & I used to play the guitar. The obsession with music has grown and developed – it all really started with electronic music though from age 14. How did your career evolve after the release of your debut EP, “Waiting Game.”? It gave me even more motivation to get back into the studio and churn more big tracks out, experimenting with my writing. Since that release, I signed with a booking agent & manager and have played all around Europe. This week I’m about to embark on my first North American tour so I am very excited to experience a change in the scene and get inspired! How have you adjusted to life as an international DJ? I like routine, it’s important for me. Travelling a lot really affects your sleeping pattern and sometimes it can be stressful. Since touring so much I have started running and that really helps me, I try and run around 40km a week. Coming home to my family & friends in my hometown or my girlfriend in London keeps me level headed. What is your current studio setup? I use Logic Pro as my main DAW, Event 20/20 Monitors, Roland Alpha Juno 1 & a Korg Minilogue. The goal for 2017 is to set up a new studio, the current one in my bedroom has done me well but I need room for all the hardware I’m planning on investing in come the new year. Recognition from Jody Wisternoff is what lead to your eventual signing on the Anjunadeep label, what is your relationship like with him and the Anjunadeep family? I haven’t met Jody yet but I am grateful that he passed on my music to the label, I can’t wait to grab a few beers with him on this US tour. The label has been very supportive and are always keen to hear any new music or ideas I have. They are great at getting me involved – I have played for them in London a few times recently and also at the Off Sonar party in Barcelona. What track is currently on your mind? I’m listening to the new Black Marble – It’s Immaterial album. I literally bought it 10 minutes ago, so far so good! What is the inspiration behind your recent release, “Future Eyes”? I wanted to write something deeper where the listener can drift off. It’s perfect for relaxed home listening but it also works really well in the clubs with a big sound system. I guess it would be the perfect track for me to play at a sunrise set, somewhere like Robot Heart. I’m constantly trying to improve and am experimenting with my sound whenever I’m inspired to – I’m never away from the studio for too long so lots of new music and hopefully I’ll be back in the USA next year!